No Ideas for Social Change?! Come on! Social Change – what an abstract topic! And, what a pragmatic way of saying we are experiencing change and want to stay in control of it. Social change is all around us. such as meeting people and making friends, opening a new group or business, donating for a social cause and thus helping underprivileged people in our neighborhood or somewhere else on our globe. such as uncontrolled losing your job, local swimming pools being shut down due to overspending of the local government, population growth, environmental pollution, warfare, political persecution, etc. In either way, social change is about us, our environment, what happens to us, what we want to, hesitate or will make out of it. 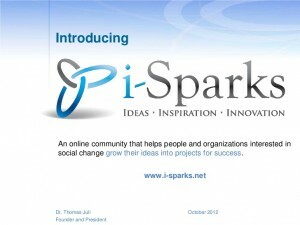 i-Sparks invites you to share your ideas of and for social change. For this purpose we have created a new forum called IDEAS FOR SOCIAL CHANGE. You can access this forum either through the community site or under the page “How it Works / Ideas – Forum”. We have installed a new plugin to our website enabling us to translate existing and new posts and pages. To start with we will add German to the defaul language of English. As we already have a growing number of pages and posts, translation into German will not happen overnight but will take place gradually, time permitting. If you want to expedite this process and help in our translation effort, contact us and we will give grant you access to the specific pages and/or posts you want to translate. Thank you for your support in making the community truly international. Today we have installed important security features into our websites: Member information is no longer visible to the public but only to registered users and only what you have approved for release. Start growing your ideas into projects for success has just become a bit easier. As of today you can use your other existing social network accounts when first registering or loging in to the i-Sparks community. In other words, it is no longer necessary to create a completely new profile, including ID and password. Instead you can use your Twitter, Google, LinkedIn or Yahoo credentials to do so. We have added new features to the i-Sparks community website. One of the most important new functionalities is that as a registered community member you can now start you own project with just a few clicks. Go to How It Works / Start Your Project and fill out the questionnaire. Once you sent it an i-Sparks Coach will contact you and start the process of growing your ideas into a project for success. In your profile settings you can now invite your friends to joint i-Sparks and help grow ideas into projects for success. You can now add multi-media to your profile and tell other members more about your interests, expertise, experiences. Multi-language: in addition to English, the i-Sparks community will become available in German, too. … tell us what features you are missing and like to have included. Use the contact form or send an email to info@i-sparks.com. 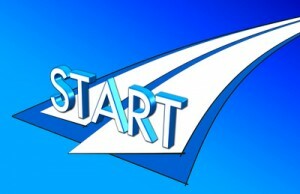 The first pilot projects will start this week (Nov 5, 2012). i.e.,we will create a mindmap with an initial idea, problem or existing project which then will be used to create a compelling MVP. Motivation – what is the driver behind the idea / problem / project? Vision – what is the overall vision and direction of the idea / problem solution / project? Project – what is / are the (initial) project objectives? For mindmapping we will use the (free) Mindomo software. Alll registered i-sparks members will receive an invitation to edit this mindmap. Starting in November i-Sparks will send out a regular Newsletter. It will include the latest about running projects, new ideas, organizational announcements, references and valuable resources for those who are interested in social change and want to do something about it. In order to receive the newsletter you have to be a registered i-Sparks community member. So, please sign up! i-Sparks will be at the 2012 PMI Global Congress North America in Vancouver, BC, Canada. 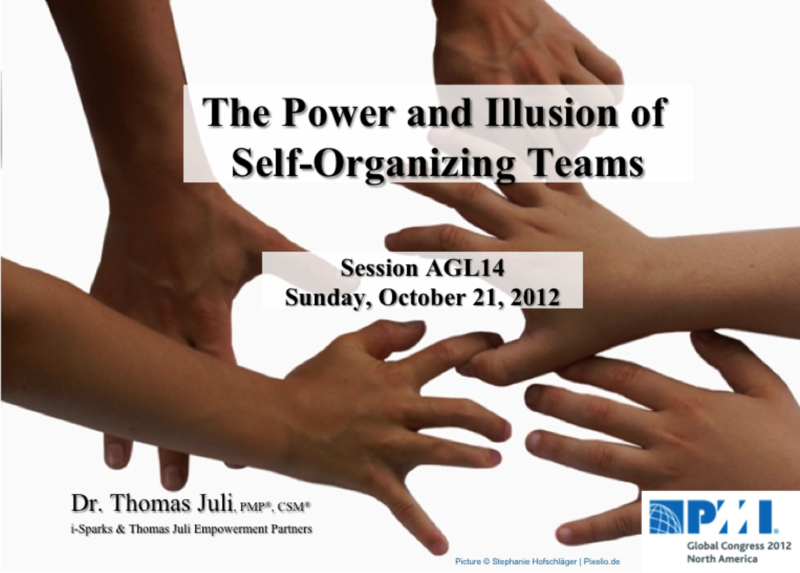 i-Sparks founder Thomas Juli will be speaking about “The Power and Illusion of Self-Organizing Teams“; as part of his lecture on October 21, 2012 he will explain how i-Sparks serves as an excellent example of how self-organizing teams may work. Visit this link for additional information. 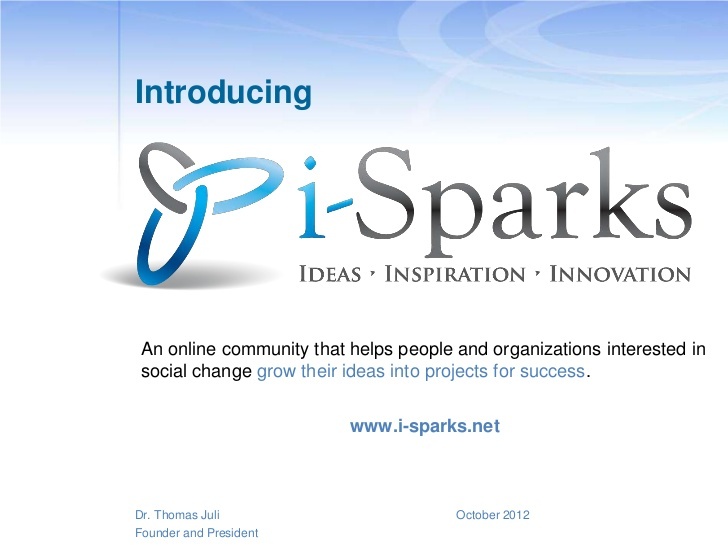 i-Sparks helps you, people and organizations interested in social change, grow your ideas into projects for success. Thus far, we have worked with two organizations and helped them set up very promising projects. One of them is a cultural organization; the other one a small business. If you too want to become an active member in this initial pilot phase, please contact us via email at info@i-sparks.com. At this early stage interaction will be via email or, if you happen to live in the Rhine-Neckar region of Heidelberg, in person.